Both coordinates should be in decimal degrees. The full map is also available. 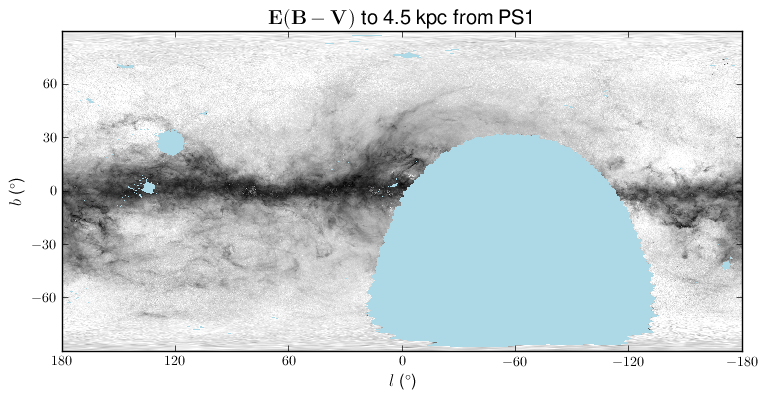 The map saturates at an E(B-V) of about 1.5 mag due to the requirement that we have g band photometry from PS1; on sight lines with total E(B-V) larger than this, our results are unreliable. An additional systematic uncertainty of 30 mmag stemming from errors in our modeling of the Galaxy's stars should also be included; see the paper for details.